Header photo: Liz enjoying her fancy new cup. Two full size 1.5 liter Smart Waters, one liter of Aquafina, sometimes a few bottles of Starbucks water, if it came to that. This was the normal haul for Elizabeth ‘Liz’ Van Aarde. 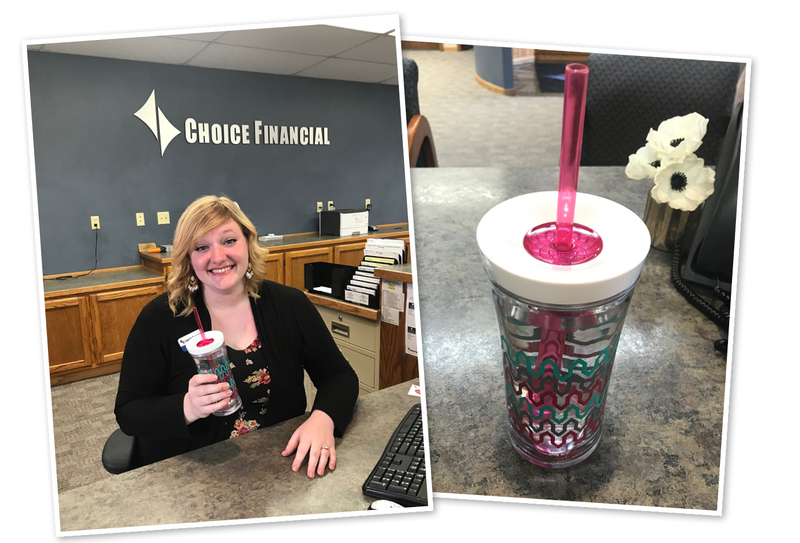 She picked up a handful of water bottles every morning on her way to Choice Financial in South Bismarck, where she was training to be a frontline specialist. “I just drink a bunch of water,” she said, laughing. She soon realized that the other girls on the team used reusable water cups, which they refilled throughout the day at the refrigerator. Liz made a mental note to pick up a cup for herself the next time she went shopping. “But I just kept forgetting!” she said. In the meantime, she was becoming great friends with the other women on her team. Katie Marthaller, another frontline specialist in Bismarck, first met Liz while she was organizing papers on the ground. “I was sure she’d think we were crazy,” Katie said. “I was sure she’d think we were crazy,” Katie said. But she didn’t. Instead, she started to see the strength of the team right away. The women asked about each other’s lives, they spent time together outside of work, they gave each other surprise presents. Katie, for instance, was given a minion-themed mouse pad, “because I love minions,” she said. 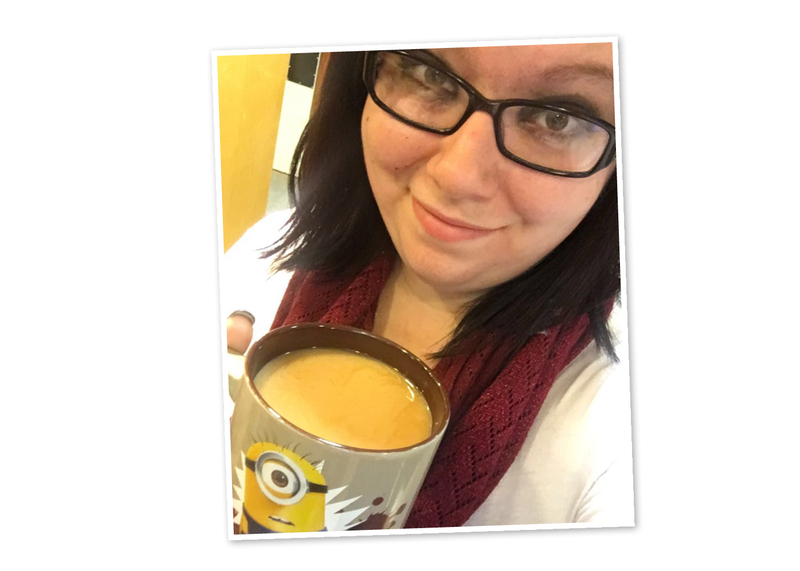 Katie showing off her Minion love with her favorite mug. As she neared the end of her training week, Liz prepared for her return to Ellendale. Katie gave her shopping tips on where to go, knowing there weren’t many options in Ellendale. Then, the second to last day of training, Liz came into work and found a surprise on her desk. “This is so cute!” Liz said. It was a reusable cup, just like the other girls’. It was pink and blue with a triangle pattern and a detachable straw. She looked around to see whose it was, and saw Katie smiling at her. “What? No way!” Liz was thrilled. Right away she took one of her water bottles and poured it into the cup. Katie had picked up the cup the night before when she was out shopping. She knew she wanted to get one for Liz because she’d noticed the bag of water bottles she brought to work each day. She looked for one with an ‘L’ on it, but when she couldn’t find that, her eyes fell on another one that seemed to be the perfect fit. Now, in Ellendale, Liz uses the cup every day. Each time, it makes her think of her friends back in Bismarck. She feels the same welcoming love from her team in Ellendale, she said. It’s that same spirit that drew her to work at Choice.